Home remedies are usually effective in treating congestion. 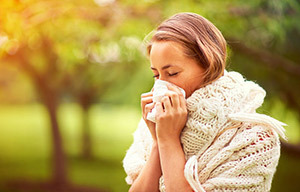 Decongestants (to shrink the blood vessels in the nasal passages) and antihistamines (to reduce the amount of mucus) provide quick relief, but they are only effective for a few days. If used longer, they may actually worsen the condition. Saline nasal sprays are a better bet, especially when used in conjunction with a humidifier to moisten the air and keep nasal passages from drying out. Drink lots of fluids, especially hot tea, broth or chicken soup.